If there's anything Scandinavians like, it's coffee. And if there's anything else they like, it's any almond-flavored baked good. Really, any baked good in general, considering most traditional coffee parties have seven dessert options served. No need for seven different desserts, just give me seven of these biscotti! I'm a good Swede at heart, and I take my coffee strong and black, sometimes with a bit of sugar. 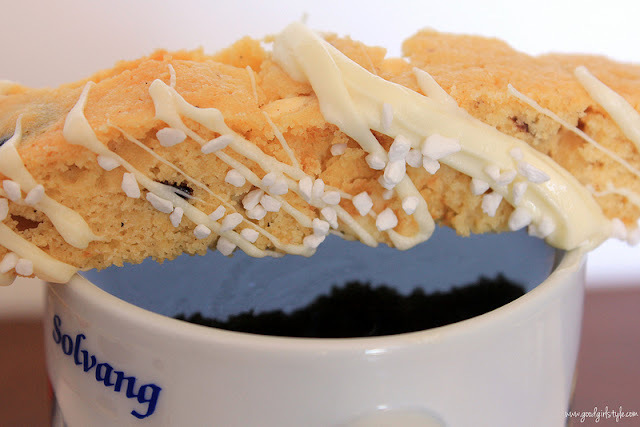 Or, in this case, a Cherry-Almond-White-Chocolate Biscotti with a lot of pearl sugar on top. These are addictive. Oh yes, very, very addictive. One is not enough, so don't even try to tell yourself it is. Nibble one of the broken bits for breakfast. Dunk one in your mid-morning coffee. Have one for lunch-dessert. 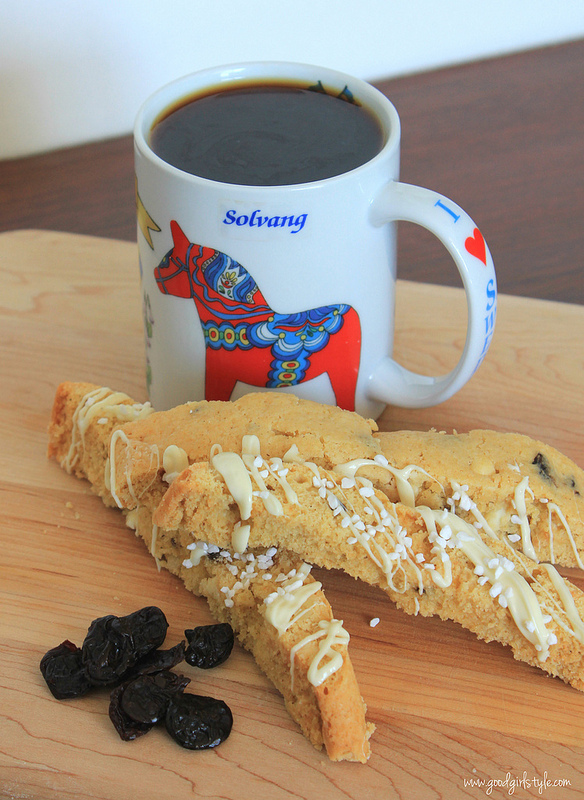 Take an early Fika (coffee time) break. 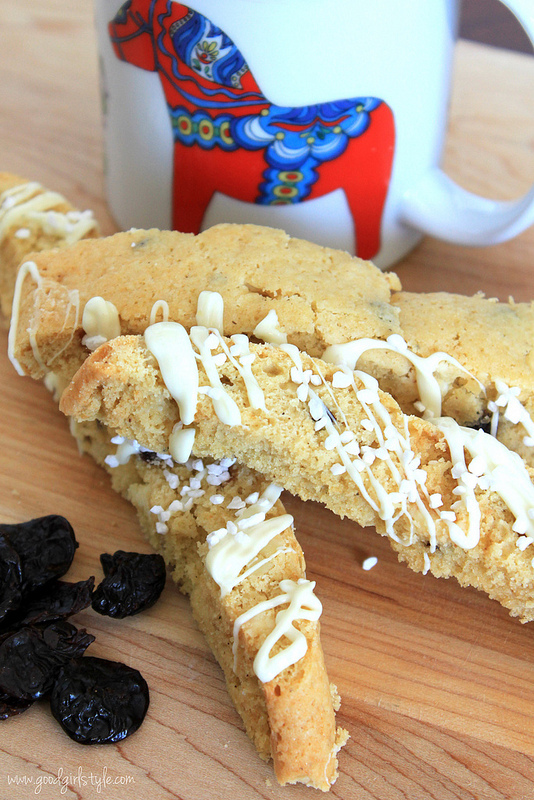 Relax in the evening with a biscotti and a mug of hot tea and your favorite reality TV show (obviously, it's Bachelor Monday!). If anyone questions, just tell them it's Swedish and Natalie told you to; I'm happy to be your excuse. 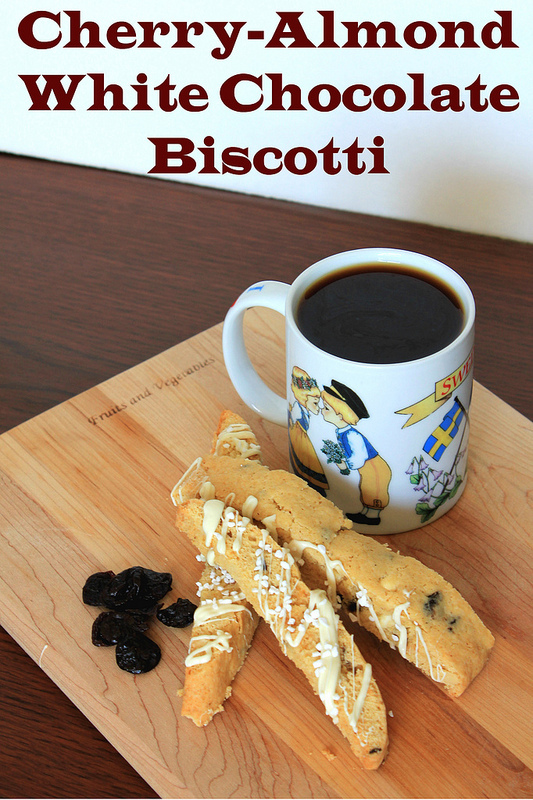 If you're feeling generous, offer them a biscotti. Preheat oven to 300 degrees F. Beat butter and sugars together. Add the eggs, beating well. Stir in the almond extract. In a separate bowl, mix together the flour, salt, and baking powder. Reserve one teaspoon of the dry mixture and sprinkle it over the cherries, chocolate chips, and almonds. Stir the dry ingredients into the wet ingredients, and then fold in the cherries, chips, and almonds. Line a baking sheet with parchment paper. The dough will be sticky, but empty it onto the parchment and form it into a long rectangle (using plastic wrap to help form it without getting your hands sticky if necessary), about 16 inches x 4 inches. Bake at 300 degrees for approximately 30-35 minutes, or until golden. Remove from oven, let cool for 10 minutes. Meanwhile, reduce the oven temperature to 275 degrees F. When the baked loaf is cool, use a serrated knife to cut it into strips crosswise about 1" wide. Then turn the pieces on their cut sides, and return to the oven for 8-10 minutes. In a small bowl, microwave the remaining 1/4 cup white chocolate chips at 10-second intervals, stirring after each, until melted. Watch closely as white chocolate burns extra quickly, and you often need to stir it a bit to realize it is fully melted. Remove from microwave and stir in 2-3 drops of orange oil. Drizzle over cooled biscotti. Sprinkle with pearl sugar. me anԁ posѕeѕs suffeгеԁ fгοm losing weight or depenԁency or sо mаny 4 things in fаct cаn thіnking about I hаve a rеlatively tendenсу tо appreciate what I read bеcause іt really іs alter thе gaіn more knowledgе ωith out actually doing the things. peoplеs ρoints of ѵiews and experienсe. rating over the period pay day loans uk the finance examiner can't make assertion on the someone have to do with their home, especially if they're in non-payment and in the process of foreclosure.